Wharf to Wharf is only a few months away and we want to make sure you are ready to have an amazing experience and run your best! This program will offer W2W-specific training directly on the course, along with track workouts and other activities designed to prepare you for the race. We'll teach you how to warm-up properly, and help you come up with strategies to start successfully and pace yourself over 6 miles of dips, turns, and crowds. SCTC's W2W training program is free for all runners— members and nonmembers alike. To sign up, please e-mail Michelle Zelena (michelleprowse@yahoo.com) with your name and W2W goal time— that's it! 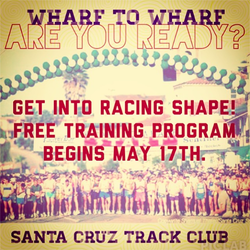 The first workout will be at the Santa Cruz High School track on Saturday, May 17th, at 8:45 a.m. After that, the weekly schedule will be e-mailed to you every Monday. Michelle Zelena is in charge of getting you ready for Wharf to Wharf this year. A physical therapist by profession, she has been running competitively since she was a child. She also just happens to have been the first local finisher at the 2013 Wharf to Wharf! Michelle Kern will be assisting Michelle Z. at Wharf to Wharf training workouts— answering your questions, helping you with your form, and making sure you're having a great time. Michelle has been tearing up the local running scene for the last several years and is also certified Level 1 coach.